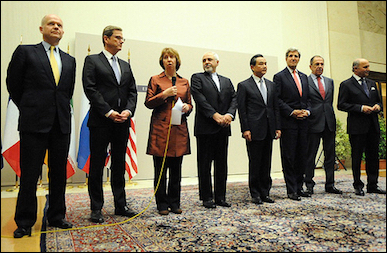 U.S. Secretary of State John Kerry and fellow P5+1 foreign ministers with Iranian Foreign Minister Javad Zarif (center), listening to EU High Representative Catherine Ashton in Geneva on Nov. 24, 2013. Bear in mind that Iran hasn't been rushing to build a bomb. Rather, it has been working steadily to increase its breakout capacity — the ability to successfully produce a nuclear weapon on short notice, if it made a mad dash to do so. According to the latest report of the International Atomic Energy Agency (IAEA), Iran has accumulated 7,154 kg of under-5% low-enriched uranium (LEU) and 196 kg of near-20% medium enriched uranium (MEU), altogether enough to build six or seven bombs if enriched further to weapons grade (i.e., about 90%). With over 18,000 centrifuges installed at the Natanz and Fordow facilities, Iran's breakout time is currently four to six weeks — which is to say, that is how long it would take to produce a sufficient quantity of weapons grade uranium (WGU) for its first bomb, according to an October 24 report by the Institute for Science and International Security (ISIS), plus whatever extra time is needed to construct a serviceable explosive device. 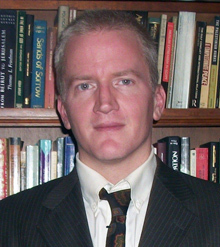 Gary C. Gambill is a Shillman-Ginsburg Fellow at the Middle East Forum.